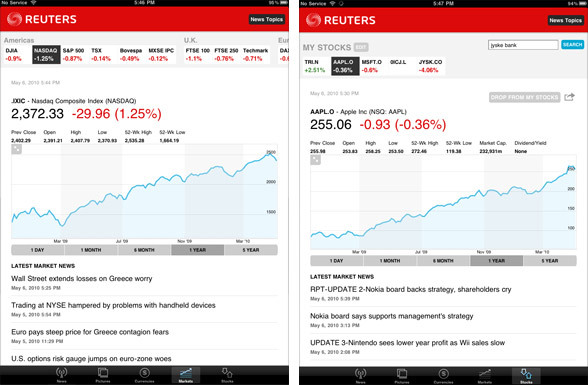 I have been playing around with my iPad for a few days, and I noticed the Reuters App. 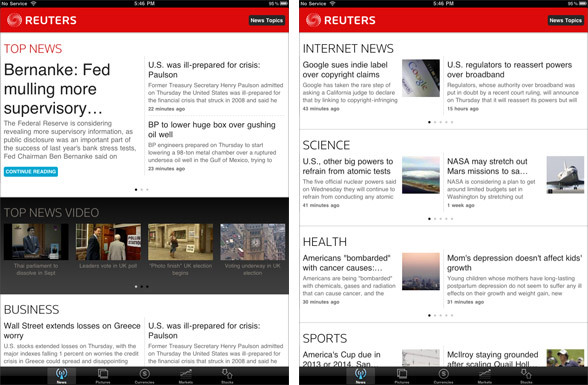 It is a very well-made news app, which gives you a quick look at the latest headlines. And it extends to be a kind of mini Bloomberg market and stock watch. It is the perfect match for any executive, who needs a generalized view of the world. So why is it free? Reuters current business model is not to sell news to the public, but to sell it to other newspapers. They create news, for others to publish. It is a business model that works well in the traditional world, but not in the digital world. We don't need to have the same article republished, redistributed, and copied a bazillion times. In the digital world, news is not a destination. Every news agency is looking at a future where there is no middlemen, where every article has to be unique, and where there is no such thing as republishing. For Reuters, this means THE END - unless they change. They create general news, for people who want non-specific information about the world at large. And they are already producing unique articles. They have the right product; they are just selling it to the wrong people. Sell you stories directly to the reader, skip the middlemen. 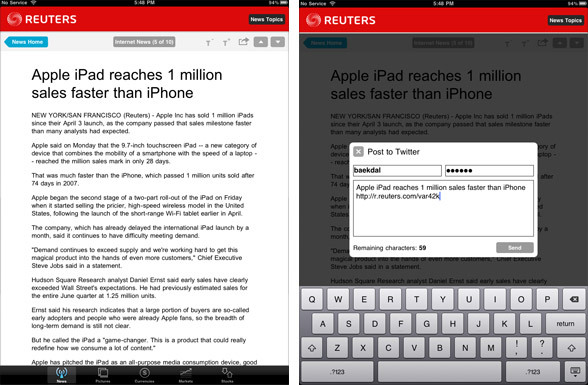 Reuters do seem to realize this with their website and their iPad app. The focus is there, but forget the money. They make the same mistake as so many other companies. Do not give away something for free, that you later need to charge money for. So @reuters, why is it free?